NORDIMPIANTI can use its long and comprehensive experience in the industry to supply the best detailed design layouts for all types of production plants including those producing products such as hollow core slabs, T Beams and vineyard posts taking into account all production and technical requirements. Nordimpianti designs all plants, large or small, with the goal of making the customer's investment as profitable as possible. Nordimpianti help your ideas become investment opportunities. We are able to supply everything from standard plant which includes moveable production machines right up to highly automated carousel plant for high production outputs. 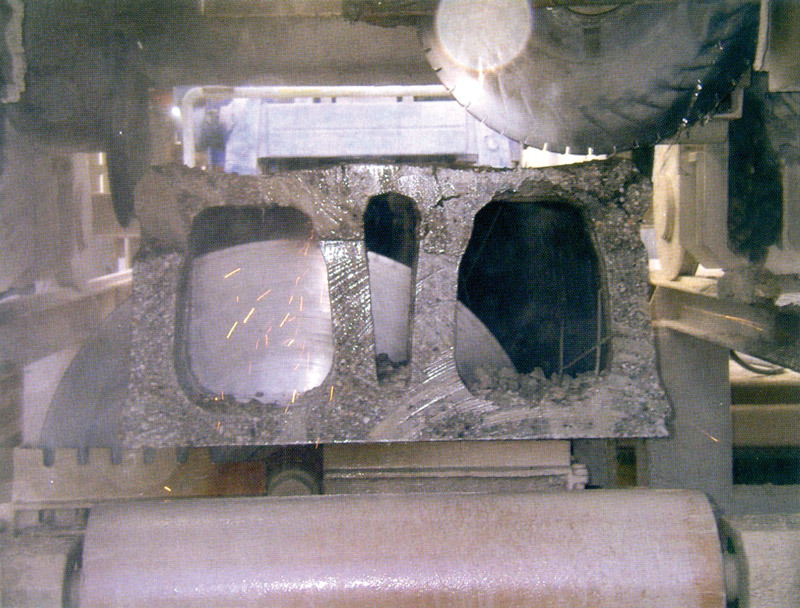 The standard production plant has either a concrete or a steel casting bed according to the product to be manufactured. Beds with lengths from 80 m to 150 m are fixed while the production machines move over them. 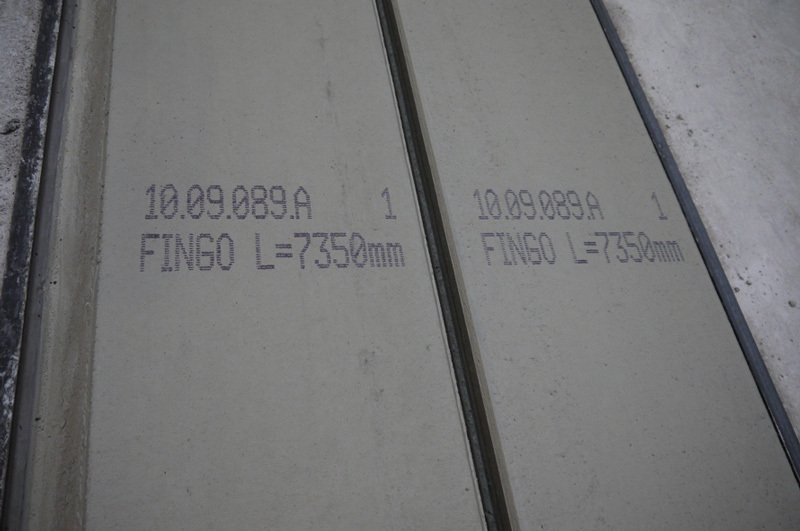 The number of casting beds can be decided for the production demand of today but planned to be easily increased to take into account any future expansion according to the space available. 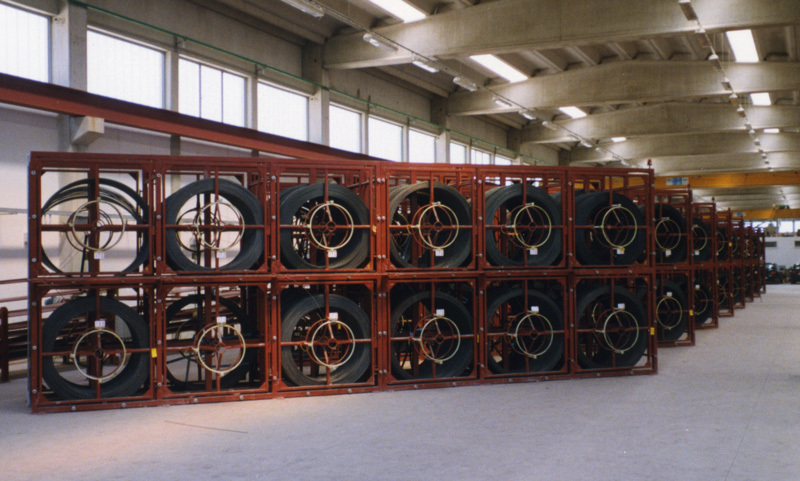 NORDIMPIANTI has designed and supplied more than 200 plants all over the world. Carousel plants are characterized by having fixed casting and cutting machines while the production beds move underneath them on a carousel. 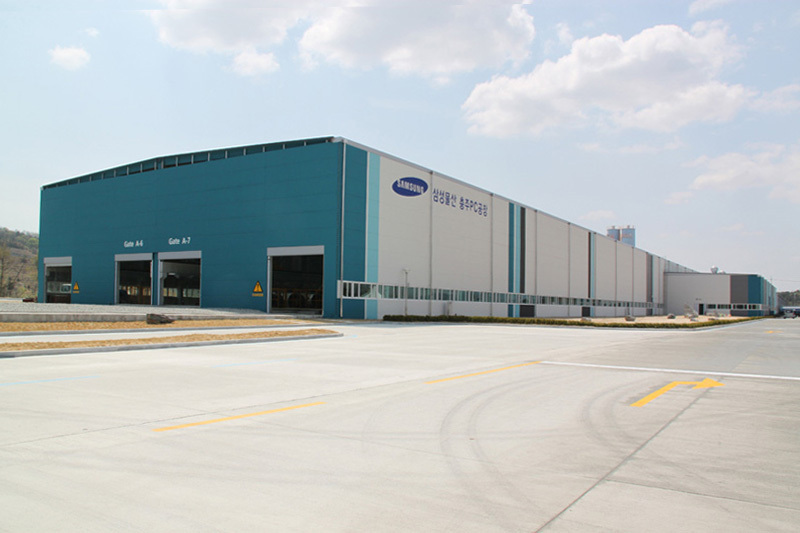 The factory is divided into two areas, one for the production and the other for the product curing. 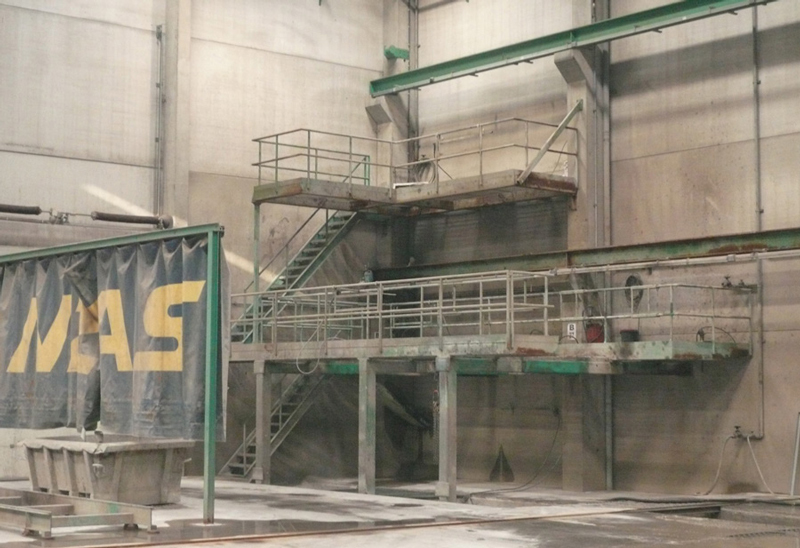 The casting and cutting machines are positioned in the central area. 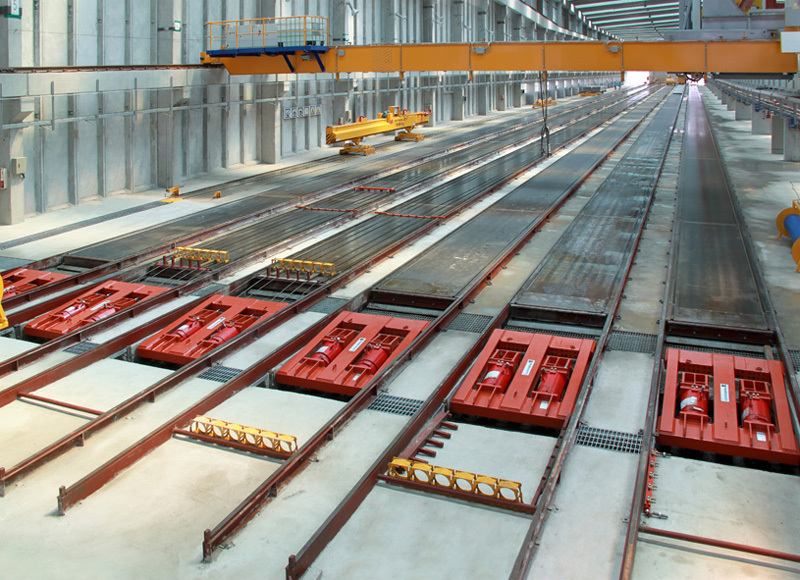 The double casting beds, each one 150 m long are self reacting without the need for abutments. With this particular plant it is possible to produce up to 3600 m2 of hollow core slabs or 27000 m of T-Beams a day with minimal personnel. Designed to cut large elements up to 1 m high this station has two cutting heads, one that cuts from the bottom and one that cuts from the top each equipped with 1100 mm blade. In this way it is possible to cut high elements with standard blades. Surface Area: Taking into consideration a future expansion, an area of between 20 000 to 40 000 sqm is suggested. Location: To be in the centre of the region in which one intends to operate, so as to keep the costs of transportation of the finished product to a minimum. It should be outside the urban perimeter to allow room for expansion and not be limited by other factories expanding. Lay of the land: Level with efficient water drainage. Surface of land: Very hard and consisting of appropriate landfill material which has been rolled and compacted. This is very important for the movement of loaded heavy trucks and forklifts. (approx. 30 000 m2 of product) and the individual storage areas should be separated by access roads not less than 3 m wide to allow the smooth and easy movement of product to, from and within the area. The stacks of elements should be neatly in line and should not normally exceed 3 m in height. Every element is stacked and separated by wooden spacers that are sufficient to allow a forklift truck to access and lift the elements or to allow access for the lifting ropes. 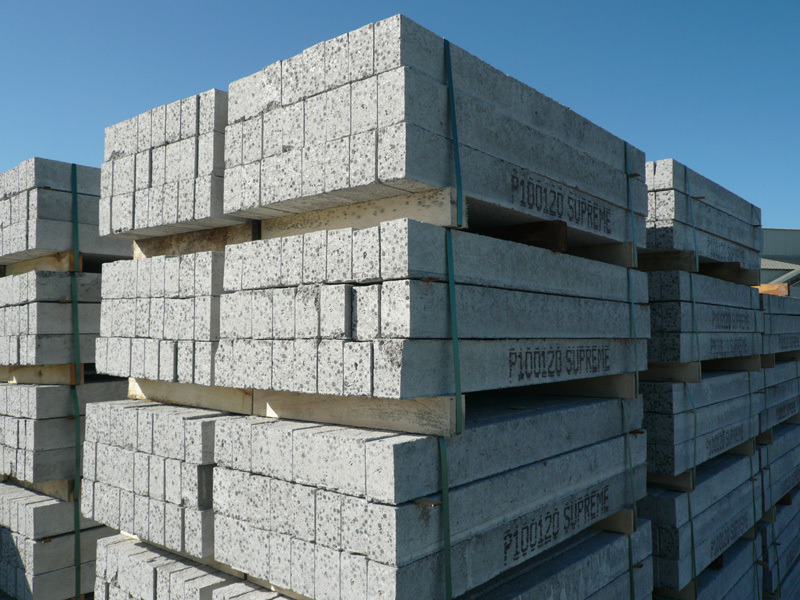 In order not to cause cracking on the elements the spacers must be placed in perfect alignment one on top of another between the elements and their position must be calculated and noted in the production and lifting schedule of the slabs. The size of the factory in which the production beds are build depends on many factors but first and foremost on the production output required. This will then determine the number of production beds needed to reach this daily target. f the factory is pre-existing and cannot meet the above parameters it is still possible to adapt the system in order to maximaze the efficiency of the factory. The pillars should be spaced at between 6-10 m intervals and must have a shelf capable of supporting a overhead mobile crane with a minimum lifting capacity of 8-10 tons. The walls and roof can be made in the most economical materials available. 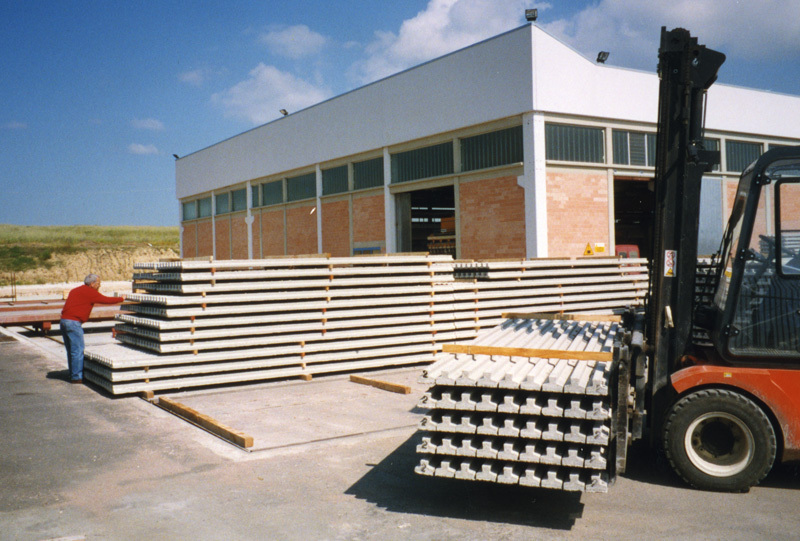 If the project is properly planned the factory can be constructed almost entirely by using precast elements produced by the production facility itself. 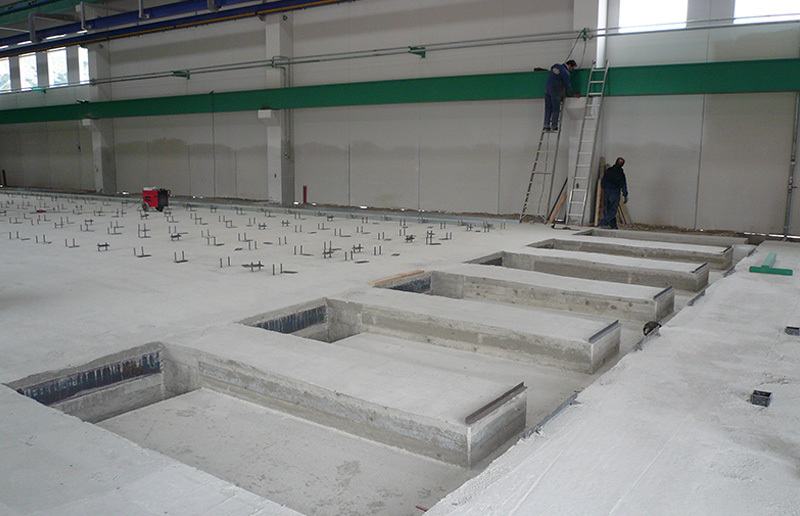 The production beds can be made ​​of concrete, directly laid on the floor of the production hall or made in steel carpentry. The type of production bed chosen depends on the type of product being produced. 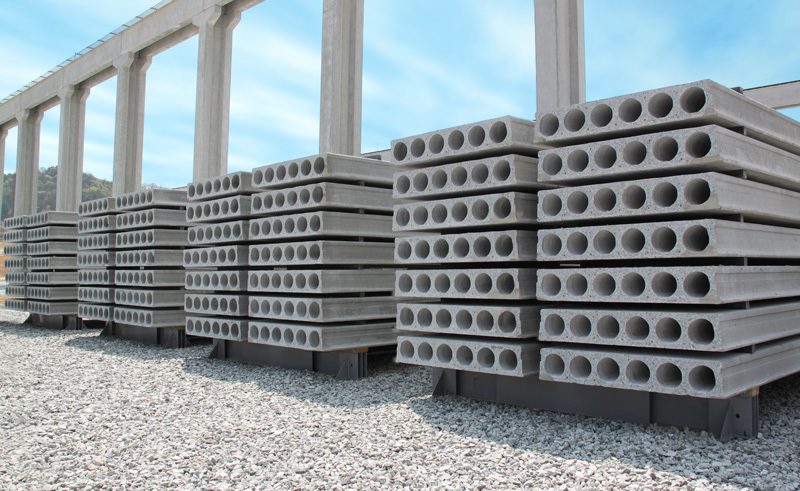 Concrete production beds are mainly used when the element surface in contact with the bed does not require a high finish, for example, posts, t-beams or lintels. However steel production beds are used when the element surface in contact with the bed must have a good accurate finish such as for the production of hollow core slabs or other slab types. In both cases the production beds are a vital factor to achive good quality elements and therefore must be made with the utmost care and precision. A typical installation consists of between 9-12 production beds of about 120-150 m in length with a rail gauge of 1.45 m.
Number of production beds: With 9 beds available it is possible to manufacture 4-5 production beds per day even without the help of supplementary heat curing depending on the local climate. A major advantage is being able to alternate the production of different elements smoothly and without hindrance. Production bed length: The ideal production bed length is 120-150 m. This length provides the most effective distance for the steel wire tensioning and is the most suitable for all phases of production. 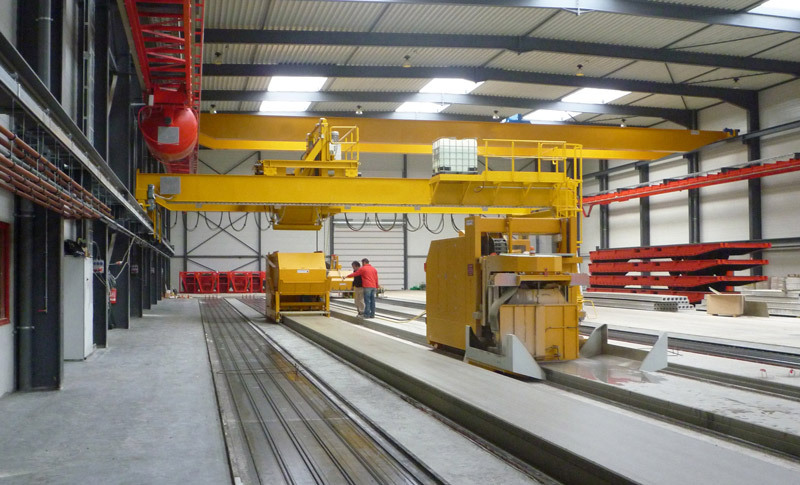 However the length of the production beds can be up to 250 m or more. Width of the bed: The standard width is 1.45 m and derives from the need to produce standardized slabs, 1200 mm wide and lower multiples. When smaller elements, such as inverted T-beams for flooring and vine posts are being produced, the production can manufacture as many as can be fitted onto the width of the bed. Example: 10 no. inverted T-beams each 120 mm wide can be produced. This means 10 T-beams x 120 m x 5 runs per day = 6 000 m of T-beam production/day. 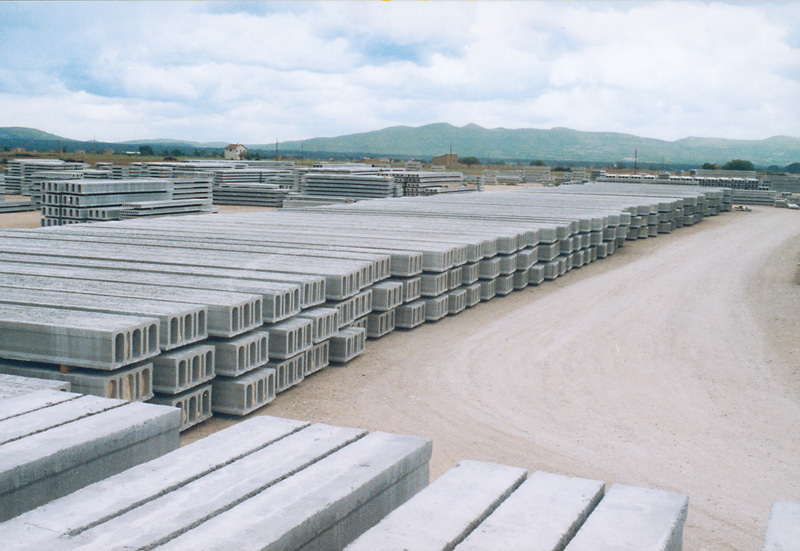 The production beds are made out of concrete and bordered on each side by rails on which all machinery and equipment runs during the various production phases. The edge of the beds are 12 mm lower that the top of the rails. The surface of the concrete beds is carefully ground and smoothed with special polishing machine fitted with a diamond implement. 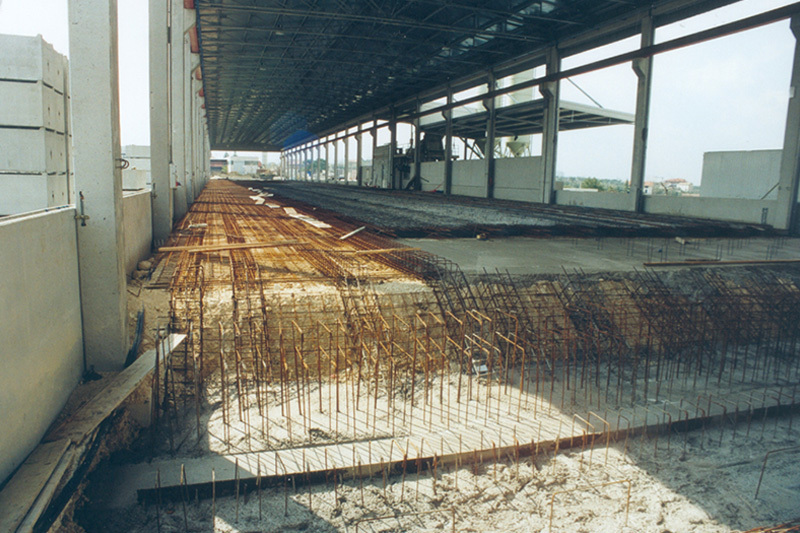 A typical installation consists of between 4-6 production beds of about 120-150 m in length with a rail gauge of 1.45 m.
Number of production beds: With 6 beds available it is possible to manufacture 2-3 production beds per day even without the help of supplementary heat curing depending on the local climate. Or if larger production rates are required it is possible to produce 5-6 production beds per day with supplementary heat curing and correct planning of the work phases. Production bed length: The ideal production bed length is 120-150 m. This length provides the most effective distance for the steel wire tensioning and is the most suitable for all phases of production. 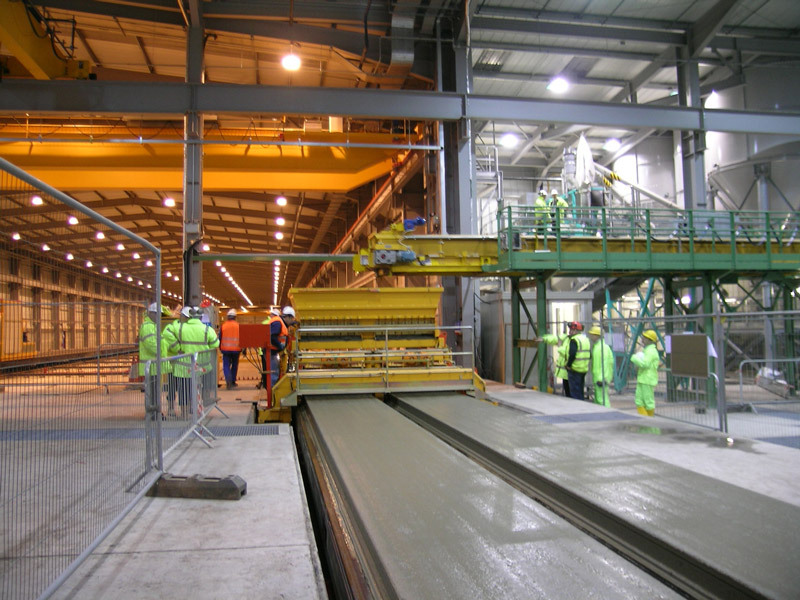 However the length of the production beds can be up to 250 m or more. Width of the bed: The standard width is 1.45 m and derives from the need to produce standardized slabs, 1200 mm wide and lower multiples. The bed is composed of 2 “C” profiles running longitudinally on each side connected with transversal IPE beams for rigidity. The bed floor is made from high quality steel. 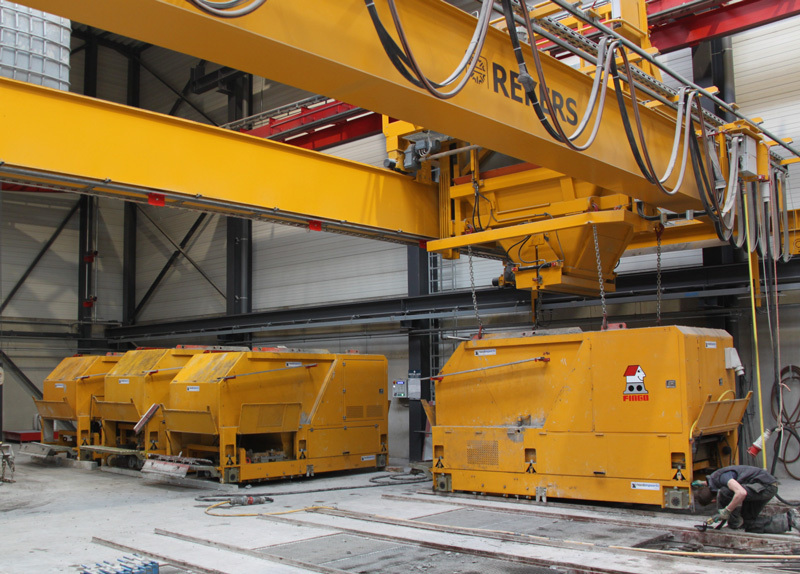 Side edges are mounted on the production bed floor and act together with the moving sideformers of the machine to contain the concrete and maintain its profile. 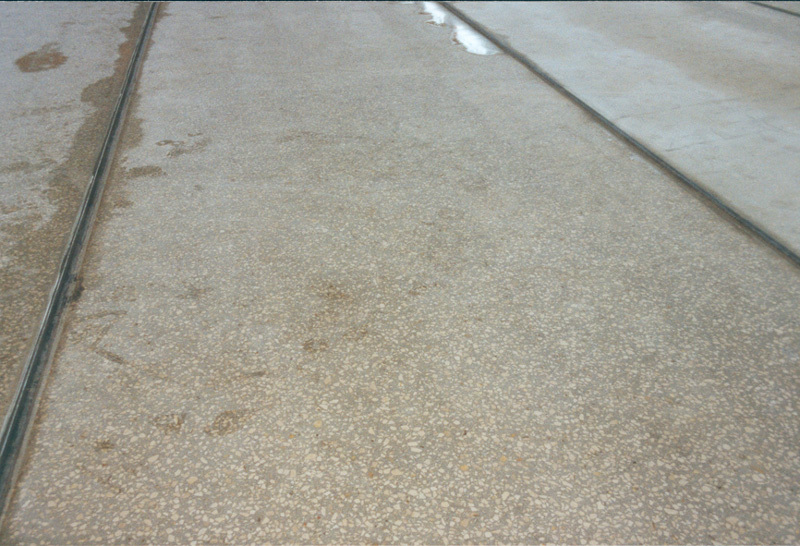 The running rails are separated from the side edges in such a way that a space is created between the rails and the element being produced, useful during the cutting phase for the containment and drainage of the cooling water. If required heating pipes can be installed under the bed for element curing. The production bed is fixed in the centre and with side fixings that allow the expansion of the bed during the heat curing phase. Both concrete and steel beds have a slope of 2-3‰ to allow for the natural draining of the cooling water used in the cutting of the elements. 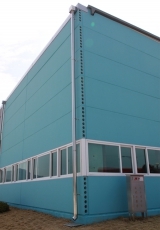 In general the civil works are not very complex and detailed drawings are supplied from Nordimpianti. 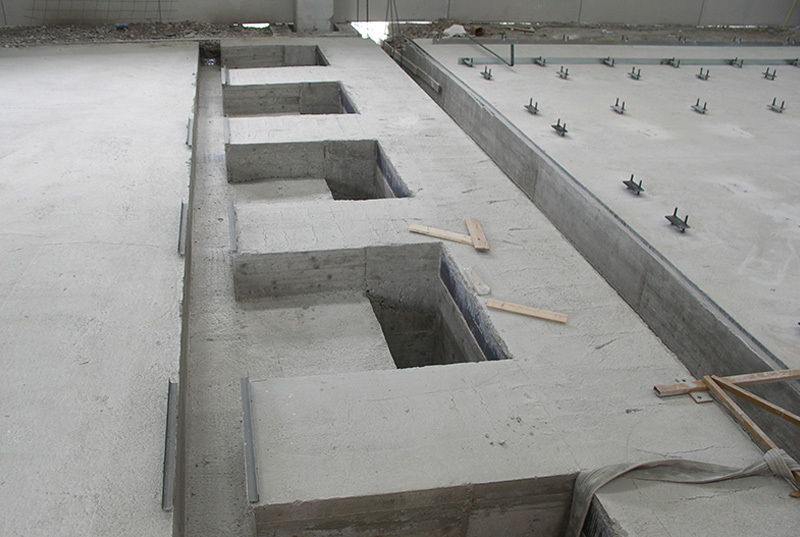 The concrete abutments are placed at the head of the production beds and have the task of reacting against the force of the pre-tensioning wires. The abutments can be designed in different ways. The most common way is rely only on the weight of the abutments and therefore design them appropriately to carry the static load. Or alternatively, if the floor of the production hall is properly reinforced it can also be considered in addition to the weight of the abutments. When designing and constructing the abutments it is advisable to size them for the maximum loading envisaged in the future. Nordimpianti recommends the abutments be designed to withstand a pulling force of 400 tonnes per bed, sufficient to produce elements with a height of 1 m and 22 m or more..